Visualizing that you are removing or shielding yourself from energy is helpful for creating a necessary energetic boundary between yourself and others. There are two visualizations that are recommended for empaths. The first should be used in the morning after waking up, and at night before going to sleep. Stand quietly, taking deep breaths with your arms out stretched. Imagine that a giant pair of scissors are cutting around your body, as if to make a paper cutout of you. Picture the scissors cutting away all energetic ties and negative attachments. This allows you to become one with the energy of release. Hold a piece of Black Tourmaline in each hand to take this to the next level. Meditating with crystals will help bolster your emotional wellbeing, and allow you to cut the cords of energy vampires who are draining you of all your energetic life force. Black kyanite is recommended for empaths because it acts as a “sword” to take to unhealthy ties. It protects the energy field from people who feast on your positivity, but offer you nothing back. Connecting with Kyanite’s energy when your own energy is drained, forces you to evaluate what’s getting you down. When you decipher what energy is yours, and what energy has been stuck to you, you can set about releasing that toxic negativity. This crystal works with all of the chakras to bring your energy field back into alignment. 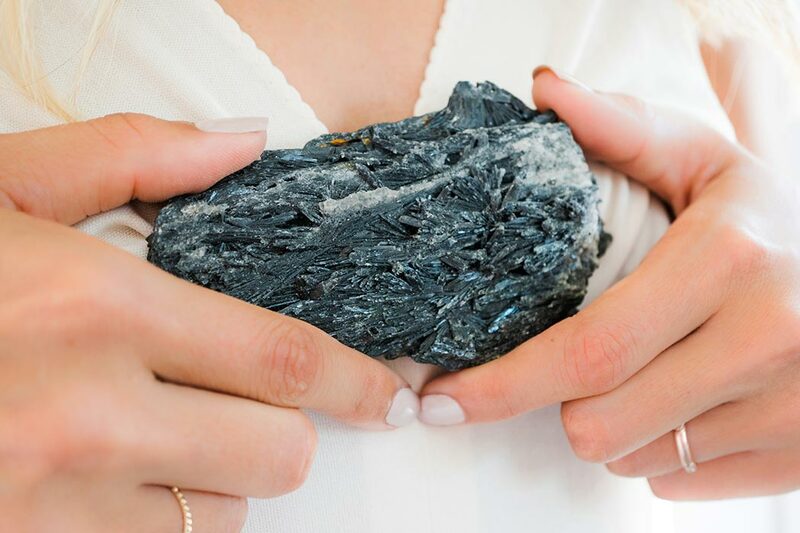 Sit with black kyanite in meditation, or use it in combination it with the visualization technique. Holding a piece of black kyanite in your hand, sweep it over your body as you picture it cutting away ties. Your home should be your sacred space, where you can escape from all of the energies seeking to attach themselves to you. One way to protect the purity of your space, an essential for protection for empaths, is to create a crystal grid around it. Black tourmaline is a highly protective and shielding crystal. Place a piece of black tourmaline outside all of the entrances to your home. If you are already feeling a dark energy, for added protection, place a piece of black tourmaline in each of the four corners of the room, with small bowls of sea salt to soak up the negative energy. Clearing your energy is about more than getting rid of negative feelings. Sure, those are the most obvious moments when we know we need to clean our energy field, but it’s just as important to clear your personal energy when your focus or intentions have drifted out of alignment. For me, energy clearing is a way to get rid of anything that’s attached to my energy, and is distracting or consuming my energy. It can be really easy, in today’s fast world, to be inundated with energy coming at us from all directions. What’s important about these five ways for clearing your energy field, is that when you’re feeling overwhelmed, confused, or stuck, these are easy techniques that can bring you back into a state that is focused, aligned, and both physically and spiritually empowered. One of my favorite, simple practices to use for clearing your energy field is combing you aura with Selenite crystal. By taking a selenite wand and dragging it over my energy field, I can feel my energy beginning shift within minutes. All you have to do is brush over the space in front of your face and body, over the sides of your body and down to your feet, over the back of your body, and lastly over the top of your head. It doesn’t matter what order you do this in. You just want to make sure that the selenite is able to connect with each area of your aura to cleanse and uplift its energy. Another easy way to practice clearing your energy field is to do a good sage cleansing. This ancient Native American technique has long been used as a way to purify the spirit. A few things you’ll need to perform this purification method are a lighter, a fireproof container or abalone shell, a stick of sage, and a feather. Light the stick of sage to release the cleansing smoke of sage. As you do this, ask that the spirit of sage cleanse your mind, body, and soul with the energy of love and light. Use the feather to waft the smoke over your body. Make sure to catch the ashes of the sage stick in your fireproof container or abalone shell. Then return the ashes to the earth by pouring them outside. If you’re keen on saving time, cleanse your spirit at the same time as you clean your body. Create a purification bath by adding 15 to 20 drops of lavender oil, a piece of detoxifying shungite, and half a cup of sea salt to the warm water. As you sit in the bath, continue to keep purification in mind and use one hand to draw an infinity symbol on the surface of the water. Sit in the bath for at least 11 minutes. Remember to have a nice big glass of water nearby so that you stay hydrated while in the hot bath. When you’re done with the bath, release the water down the drain. Stay seated in the bath as the water drains out, and visualize all of the stuck or negative energy that’s been attached to you is washing away with the water. After you’re done with the bath, take a very quick rinse in the shower to splash off any lingering energy that you detoxed out during your bath. A quick way to cleanse and reprogram your energy is to repeat a mantra for 3 minutes. You can do this by repeating a powerful mantra like om mani padme hum, or simply by chanting om. You can also create your own mantra by stating an intention you want to hold in your spirit. When I’m feeling overwhelmed by work or obligations, I find it incredibly helpful to sit in a peaceful area, engage in some deep breaths, and repeat, I am clear. It’s the repetition of the power of sound that works to clear your mind, and deepen the state of meditation that your in. Another technique you can repeat for 3 minutes is ringing a singing bowl. This continuous action works to align your body and spirit, as the sound breaks up stagnant energy. To fill your aura up with love and light after you’ve cleansed, hold a piece of selenite to your chest, and state aloud, I want to fill every cell within my body with the healing white light of abundance. May I vibrate at my highest vibrational potential. May I feel electric with inner power. State out loud all of the things you want to fuel your soul with. Combine as many of these techniques into one cleansing practice as you want. Remember, the more you engage the mind, the physical body, and the spirit with these practices, the more connected you will feel to yourself as a whole.